Shop at Home/Walmart deal: Nostalgia Electrics 4-Qt. 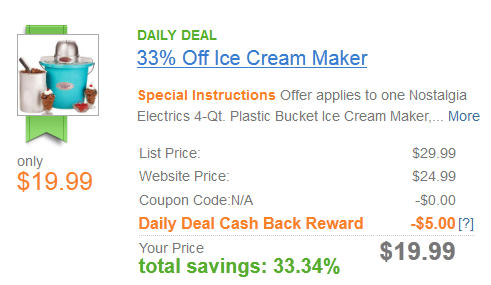 Plastic Bucket Ice Cream Maker, Blue 33% off - $19.99 after $5 cash back from Shop at Home. Must be a Shop at Home member to get this special pricing! Free in-store pickup! Sign up below to get started and get a $5 gift card from Shop at Home if you're new to Shop at Home!